Delhi plants are so fresh, it’s like they belonged in your garden all along. At our garden center, you’ll find the products and resources you need to introduce new plants to your yard successfully. 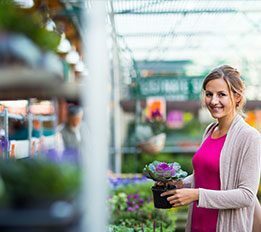 At our garden center, you’ll appreciate the selection and quality that comes with investing in local, fresh plant life. Skilled gardeners have nursed these plants to maturity, meaning that they will be pest-free, live long and look their best. Plants are transported from the field or state-of-the-art greenhouse to shelves in one day, never left in a cold case or placed in the confines of a truck for more than a few hours. When you buy local, you buy healthy plants that haven’t suffered the temperature and light variations associated with travel. At Delhi, you have access to the plants themselves, which sit out in the open, ready for your inspection, as well as knowledgeable staff members, who have the experience necessary to answer questions regarding plant care and landscaping. Staff members are particularly well-versed in native plants, specialties of local nurseries. Native plants are particularly hardy and easy to care for because they are accustomed to the local soil, climate, and changes of seasons. They require less pesticide, water, and fertilizer, saving customers time and money. Make your new purchases feel at home by taking steps to ease their adjustment to your yard. 1. Be cautious when transporting new plants; paper and plastic materials, such as sacks and sleeves, protect plants, so request some when shopping or take your own. 2. Bring new flowers and greenery directly home, then drain extraneous water to prevent root rot. 3. Before planting, take a moment to reflect on the best location and arrangement for your new items. 4. When planting container-grown specimens, dig a hole deep enough to hold the plant at the exact depth it was growing in the container. Any obstacles should be removed to make way for the plant. Carefully slide the plant out of the pot; if you’re having trouble separating the two, tap the bottom of the container to dislodge the root ball. Place the plant in the hole and surround the roots with soil. 5. Water your new plant then add more soil until the hole has been filled completely.